When it comes to matching the hatch, more options ensures better outcomes. So stock up on VMC’s new finesse baits, which mimic a wide range of forage, including aquatic insects, crustaceans and baitfish. The new Crayfish Jig, Luv Bug Jig, Boot Tail Spinnerbait, Curl Tail Spin Jig and Probe Jig all come pre-rigged with Trigger X® soft-plastic bodies in numerous natural and eye-grabbing color patterns, further enhancing your chances for matching the hatch. Each new VMC bait comes armed with a VMC Power Gap Hook, which features a 5-percent wider gap than traditional jig hooks, allowing a better hook-up ratio. Each also features a 90-degree line tie, which ensures optimal horizontal position of the jig, allowing anglers to convert more hits into solid hooksets. 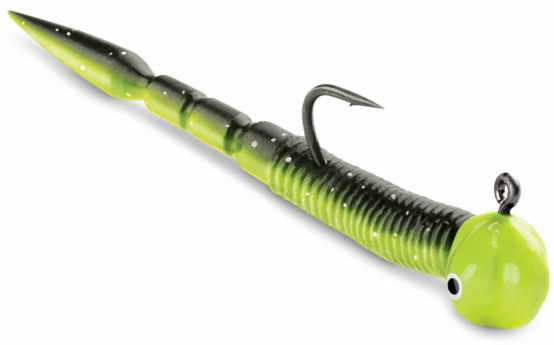 The new Crayfish Jig comes pre-rigged with a Trigger X soft-plastic crayfish body. Cast it around rocky shorelines, brush piles and laydowns for fish feeding on small crayfish. 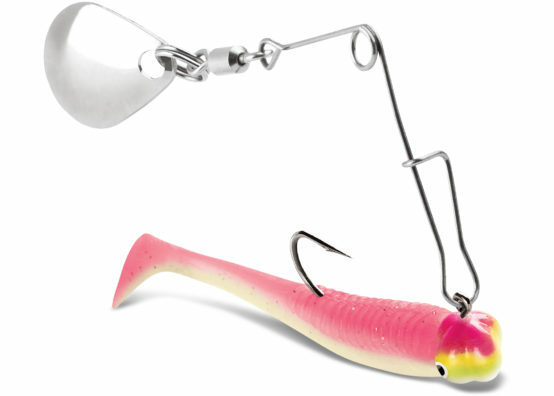 The Luv Bug Jig is pre-rigged with a Trigger X soft-plastic Luv Bug body, which features a heart-shaped tail that flaps and waves, tempting even the most finicky of fish into biting. Pound it on the bottom to stir up a following for goliath perch, go deep in the jungle for bug-hatch seeking slabs, or twitch it over open water to simulate the fleeing action of big aquatic insects. It’s available in 8 color patterns – Black Chartreuse Glow, Crappie Minnow, Glow, Glow Chartreuse, Green Orange Glow, Orange Chartreuse Glow, Pink Chartreuse Glow and Red Pearl Glow. It comes two-per-pack in two sizes – 1/32 oz. (No. 6 hook) and 1/16 oz. (No. 4 hook). 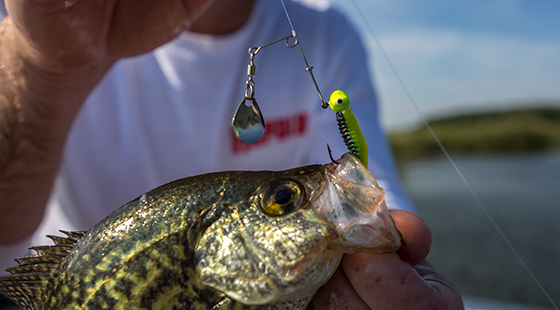 The tiny Probe Jig replicates small fry and baitfish with a unique, spear-like profile. It comes two-per-pack pre-rigged with a Trigger X Probe soft-plastic body. It’s available in eight color patterns – Black Chartreuse Glow, Crappie Minnow, Glow, Glow Chartreuse, Green Orange Glow, Orange Chartreuse Glow, Pink Chartreuse Glow and Red Pearl Glow. It comes in two sizes — 1/32 oz. (No. 6 hook) and 1/16 oz. (No. 4 hook). The Curl Tail Spin Jig fits the bill as both a bass-targeting finesse bait and as a primary panfish offering. 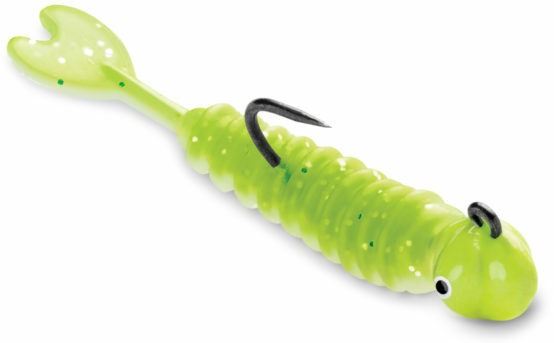 It features an under-spinning Colorado blade and comes pre-rigged with a Trigger X® Curl Tail soft-plastic body. A ball bearing swivel connects the blade, allowing for maximum rotation and flash. Featuring a long and curled micro-thin tail, the Curl Tail body emits a light and subtle vibration as it swims. It’s available in 6 color patterns – Black Chartreuse Glow, Crappie Minnow, Green Orange Glow, Pink Chartreuse Glow, Pearl White and Red Pearl Glow. It comes in two sizes – 1/16 oz. (No. 4 hook) and 1/8 oz. (No. 2 hook). VMC’s Boot Tail Spinnerbait is another flashy finesse offering for bass and primary bait for panfish — with the added benefit of being weedless. 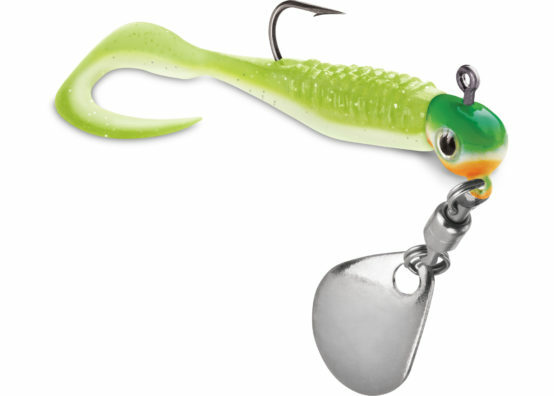 It features a Colorado blade on a paperclip-style arm swinging from the eyelet of special ball-head-type jig pre-rigged with a Trigger X Boot Tail body. Featuring long, micro-thin mid-sections terminating in a boot-shaped tail paddle, Boot Tail Minnows swim with a light and subtle vibrating action. This entry was posted in VMC and tagged Boot Tail Spinnerbait, Crayfish Jig, Curl Tail Spin Jig, Luv Bug Jig, Probe Jig, Trigger X, VMC. Bookmark the permalink. I’m in an electric wheelchair got hurt in Vietnam. Yes, these will absolutely work on those bodies of water. From 1 Vietnam Era Vet to another God Bless you! I am glad that you can get some fishing in! Good luck. And take care. Your service is much appreciated. I was also in country, two tours! Didn’t know that there was a two year program! ?! So I did four. All overseas. Join the Navy and see the world! Will they work in saltwater ? These are more intended for Panfish use! More eye candy! ! I gotta get me some!